A journey to discover the traditions of the Riviera of Flowers, with excursions to botanic gardens and visits to sample food and wine, on the Nature and Traditions tour. On the Riviera of Flowers there is a real paradise for you to discover, an environment full of enticing colors, scents and flavors, in an area that is rich in traditions. Thanks to this special itinerary you will get to experience and appreciate the wonderful attractions of the Ligurian Riviera: olive groves, vineyards, gardens in bloom, hilltop villages and little olive oil presses. Arrival in late afternoon in San Remo, check in to hotel. Dinner and overnight stay. After breakfast you will transfer to Dolceacqua in Valle Nervia, from where you will set out for the home territory of the Doria family, the “Doges” of the illustrious Maritime Republic of Genoa. This excursion winds its way through Dolceacqua, Isolabona, Apricale and Perinaldo where you will discover a flourishing natural environment, a land of olives, of vineyards and of fascinating medieval villages which have managed to conserve and protect their ancient traditions. Lunch will be taken in the cantina of the Gajaudo Family, where you will be able to taste a whole range of wines from the Riviera di Ponente, accompanied by tasty local delicacies from the valley. In the afternoon your journey will take you on to the Hanbury Gardens at La Mortola. This is an exotic paradise of 18 hectares which was created in 1867 by Sir Thomas Hanbury. Here Hanbury transplanted species from all over the world, the “fruits” of his innumerable journeys. In every season this garden revels in the splendor of its avenues, pergolas, greenhouses, terraces and wells. After breakfast you will transfer to Diano San Pietro for a visit to the Patrucco Plant Nursery. This family has a long tradition of expertise in hybridization. They invented the renowned pink rose “Dallas” and for many years have been official suppliers to the Vatican. Every Christmas the roses of the Patrucco family are used to decorate the altar of Saint Peter’s as well as the stage used in the famous concert. Next you will move on to Pontedassio to visit the Pietro Isnardi Alimentare olive oil producers where, between November and March, you can taste the new season olive oil, as well as some of the local dishes from Imperia. In the afternoon there is the opportunity to visit a 17th century ancient olive oil mill which has recently been renovated. 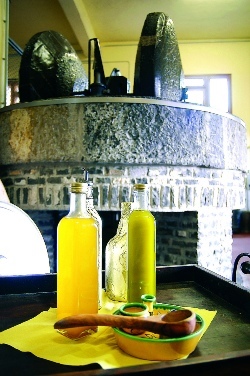 Here you will be able to see for yourself how olive oil was produced in past times. The visit to this modern oil press has another surprise in store for you, Oleum Mundum, a traditional method of processing olives. This early method of extracting the stone allowed the producer to concentrate only on the fruit of the olive. This way the quality of the oil was augmented, the acidity was decreased and they were able to produce an extra virgin olive oil with an intense, fresh aroma and a full and firm flavor. In the morning you will visit the Museo dell’Olivo (closed on Sundays), with the adjoining modern production facility and adjacent shop of the Fratelli Carli company of Imperia. The museum was named European Museum of the Year in 1993 by the Council of Europe, and is situated in the heart of the olive oil port of Oneglia, which has been there for millennia. After the visit you will continue your journey to Porto Maurizio, with its typical ancient historic center, perched on the rocks of the promontory known as Parasio, with its Piazza del Duomo, overlooked by the “Palazzo del Collegio” and the “Palazzo della Questura”. You can’t miss visiting the “Logge di Santa Chiara”, with the Convent of the same name, founded in 1365, where the Clarisse nuns still live in seclusion. Return to your hotel for lunch and rest. In the mid-afternoon you will attend an interesting Ligurian cooking course, organised in cooperation with a renowned local restaurateur (6 participants minimum). The course will offer you the opportunity to discover a wide range of typical dishes in the local culinary tradition. Among the specialities, demonstrated and prepared by Chefs, you will find panissa, a kind of polenta made with chick-pea flour, barbagiuai, fritters with pumpkin and fresh ricotta cheese filling, and lastly, switching to sweet cookery masterpieces, stroscia, a cake made of extra virgin olive oil, wine, flour and sugar. At the end of the course, you will be offered a supper, so that you can taste the newly- prepared dishes. Return to your hotel, overnight stay. Individual subscription fee covering administrative costs. Accommodation at our hotels in double rooms with half board. Admission to the Museums and Villas included in the program. Subscription fee for the Ligurian cuisine class (min. 6 participants). Round trip travel, local transportation and all that is not included under the entry “our offer includes”. Lunches and dinners are intended to be selected from the menu of the day or the tasting menu proposed by the chef. Beverages and à la carte items are to be paid for on site. The tours suggested in the program are to be considered as free, i.e. without a guide. Tour guide to visit the towns. Local transfers by auto or minibus with driver.